I was talking to a customer yesterday who is going through making some of their staff redundant and drastically cutting their expenses. Most of the expenses they were cutting was advertising and marketing related. And of course if you have been in this situation before you know how difficult it can be. There is no money to pay for marketing and advertising, however if you don’t, then incoming leads and paying client stop. It’s never a fun situation to be in. It’s why I firmly believe that as business owners we should be always building value with our community and never stop marketing. Yes, some forms of marketing have a direct cost such as Facebook Ads or printing brochures. However there are many forms of marketing that are very low cost or in fact free (except for your time). And the best method that falls into this category is Email Marketing. To get started with email marketing I suggested that they use their existing/previous clients and unconverted leads. They could use email marketing to stay in contact with them regularly. They already had the system setup, but like most business they never really got around to actually sending anything. As someone who has been marketing online since 2008, email marketing is the lifeline of my business – the essential component that I couldn’t do without. But I can see the anguish on people’s faces when I suggest they do more (or some) email marketing. 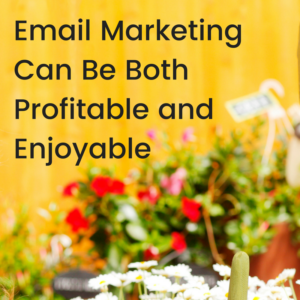 With a few simple mindset shifts and these tips: your email marketing can becoming both profitable and enjoyable. Yes. People will hit the unsubscribe button. And initially it will hurt. You will take it personally and get a little sad. But, as time goes on you don’t even notice them. In your email marketing system you can choose if you want to get notification when people unsubscribe. Turn it off. It’s not your business if people are unsubscribing from your list. Think about your own behaviour with email marketing. I am continually subscribing and unsubscribing from lists. Over time you change. I’ve been on lists about printing photo books, life coaching, business marketing, kids magazines, health, fitness, baby stuff. Your community (including customers and prospects) are no different. Their tastes and needs change over time. I would recommend checking your unsubscribe rate every six to ten times you send an email. For example if you are emailing weekly, then every six to ten weeks. If you are emailing monthly, then every six to ten months. If you have an assistant, get them to do this for you. This way you are removed from the potential negativity and you can focus on creating great content. Just remember that unsubscribes are a fact of life and more often than not, have nothing to do you with you, your business or your content. When people are new to email marketing, I see one of two situations. Either they are only about the sale – sending special after special, or they are all about value and never ask anyone to buy. To be successful you need to find the balance. Your community want to stay on your email list. They like to hear from you and are interested in your industry or products. But they don’t want to just be sold to. And on the other extreme you are running a business – you need to make money. Consider value first and then offer something for sale. If you are a recipe creator, you might send your latest recipe and a link to purchase your latest ebook. If you provide a service such as carpet cleaning, you might offer tips on how to remove red wine stains and a link to book their next clean. If you have an online store, you could provide information on how a certain ingredient can assist with a certain condition and a link to the product you sell that has the said ingredient. I’m sure you get the idea. It’s about offering value and something for your customer to buy. From time to time things will get out of balance and that is ok, as long as you have been following the next tip – Consistency. I’m sure you have heard that you need to have seven or so touch points with a customer before they make a buying decision. The latest info I’ve read is that customer touchpoints are increasing. The number now sits at approximately 17 – 18. With these figures it’s no wonder we get disheartened after sending one email with no results. In marketing (and let’s be honest, also in life), consistency is key. Just like you can’t eat fruit for breakfast after years of pancakes and expect to be healthy. You can’t send one email or maybe even two and expect a million dollar business. When speaking to other successful women in business, consistency is the word that keeps coming up. In terms of email marketing, determine your consistent schedule and stick to it. At a minimum I would recommend sending an email at least once per month. And remember the key is consistency. 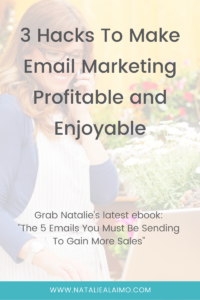 If your email marketing isn’t profitable and enjoyable just yet, implement these three hacks and you will see a notable improvement. As the marketing world is changing, email marketing is the one constant that hasn’t changed over the years and I don’t see it going anyway.